On a brisk day this past January, a friend to the Podwits, saxophonist Matt Garrison, and I ventured to a spot I’d been meaning to go to for years now: the famous landmark restaurant in Harlem, Sylvia’s. The woman behind the legendary eatery—Sylvia Woods, “the Queen of Soul Food”—passed away last week, and I thought what better way to celebrate her life than to reminisce about my afternoon trip to Harlem. The restaurant has been a staple in Harlem since 1962, when Mrs. Woods opened a small little diner-style place that was no bigger than the long counter inside, surrounded by stools that could seat only thirty-five. Now it has grown to nearly the size of a city block. I’ve been fascinated with Sylvia’s since my early teens, when I discovered what “soul food” was and saw the line of products the Sylvia’s empire has been able to sell in every supermarket across the country. My mother was a huge fan of soul food and collard greens in particular. She had a coworker who’d been cooking it all her life, and would always make a little extra and bring it in for my mom. I never really remembered my mother attempting to cook any of those gorgeous dishes herself, but she would occasionally bring home Sylvia’s products from the supermarket, and that was when I was first introduced to that lovely woman with the trademark smile that adorned all her products. Sylvia Woods’ story is a testament to the American dream. She was born in Hemingway, South Carolina in 1926 and named after her grandmother. She ended up meeting her future husband Herbert in 1937 when she was eleven, while they both worked in a bean field. They married in 1944 and moved up to New York City in search of new opportunities, like many African-Americans of the era did. She earned her beautician license by working at night and going to high school during the day. In 1954 she started waitressing at Johnson’s Luncheonette in Harlem. In 1962, Johnson offered to sell the luncheonette to her, recognizing her determination and strong work ethic. So Sylvia borrowed the money from her mother, who’d mortgaged the family farm in order to front the cash. The young entrepreneur changed the name to Sylvia’s, and the rest is history. The modest eatery has grown into a large restaurant (which can seat up to 450 people! ), which also includes Sylvia’s Lounge and “Sylvia’s Also” (a full-time catering hall); but the small luncheonette is still inside as the nucleus, all in its original location on Lenox Avenue in Harlem. As stated above, she also has a line of soul food products sold nationwide, as well as a line of beauty products, two cookbooks, and a line of children’s books. Matt and I ventured up there for lunch and luckily got seats before the lunch rush hit. 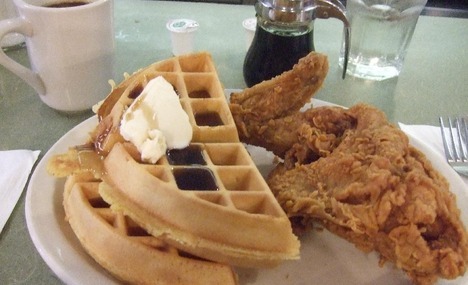 The menu touts soul food staples like “Sautéed Chicken Livers,” “Fried or Grilled Catfish,” “Grandma Julia’s Cornmeal Fried Whiting,” or the odd-sounding combo that is now a soul food standard, “Chicken & Waffles.” That last one originated in the old days, with the nighthawks who would go to greasy spoons in the wee small hours of the morning after a late night of drinking and dancing, but couldn’t decide whether to have dinner because of the late hour, or to instead have breakfast. So why not combine the two? Genius! I had the Sautéed Chicken Livers (something I would never have normally, but after seeing a special on the Food Network on how Sylvia’s prepared it I couldn’t resist), a side of corn bread, and the item that began it all for me, collard greens. Matt got catfish, a side of corn bread, and mac & cheese. The meal was glorious. I cannot put into words how good the food was. Luckily, the restaurant has stayed in the family—Sylvia’s children have taken over both the operations and the corporation, so we all can rest assured that the legacy Miss Sylvia Woods started over fifty years ago will be with us for another fifty years to come. 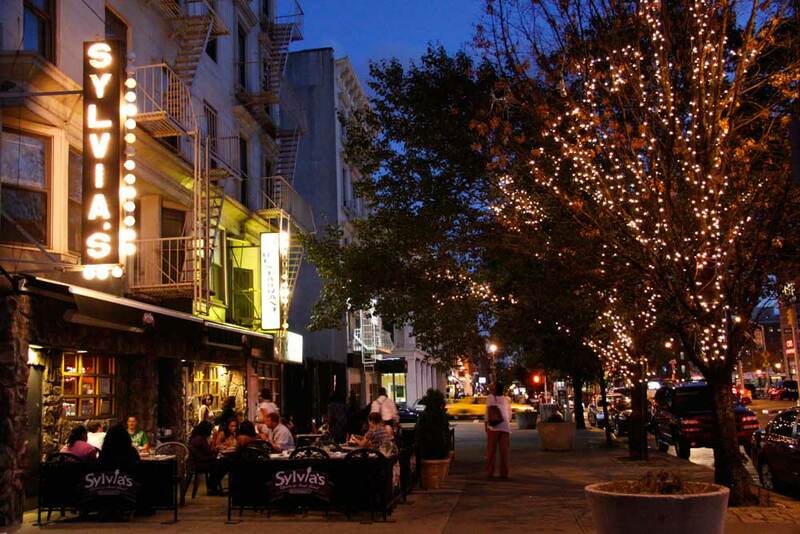 If anyone is visiting New York City, I strongly recommend taking the ride up to Harlem to treat yourself to the “Queen of Soul Food’s” landmark restaurant, Sylvia’s. If you can’t make the trip, try her delicious line of products. 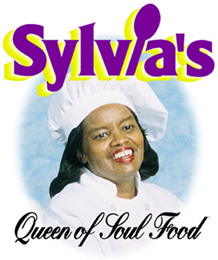 Not only has her place become a landmark for celebrities from Quincy Jones to President Bill Clinton (who spoke at her funeral), but Sylvia became an ambassador for the culinary delight of soul food, and as a result it has firmly rooted itself in our culture. 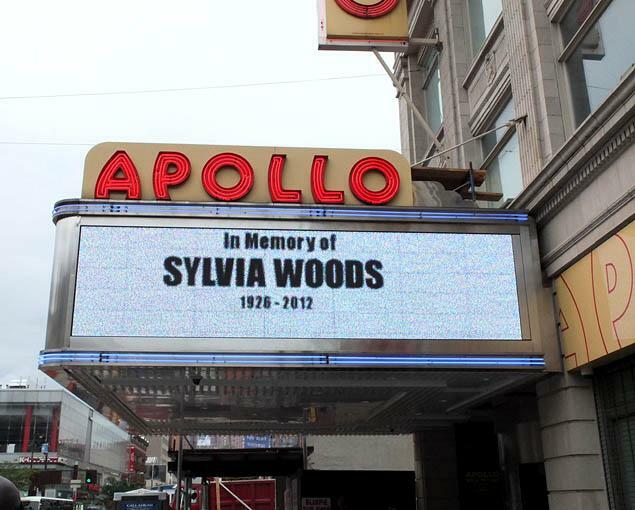 God bless you, Sylvia Woods! I cannot wait to go back and have some of that gorgeous home-style cooking in the very near future.